I’m not one to buy succulents because my yard is loaded with so many varieties! But I was really taken with the unique containers and succulents at the new Market at North Beach in #sanclemente (Wednesdays 3-7pm). Beautifully Tarnished had a booth today with some amazing unique succulent arrangements in small heavy steel containers, some organically tarnished (no acid), and some painted in bright colors like the pink one I purchased. But the story of this small new business is even more amazing. A portion of planter proceeds are donated to the American Foundation for Suicide Prevention. 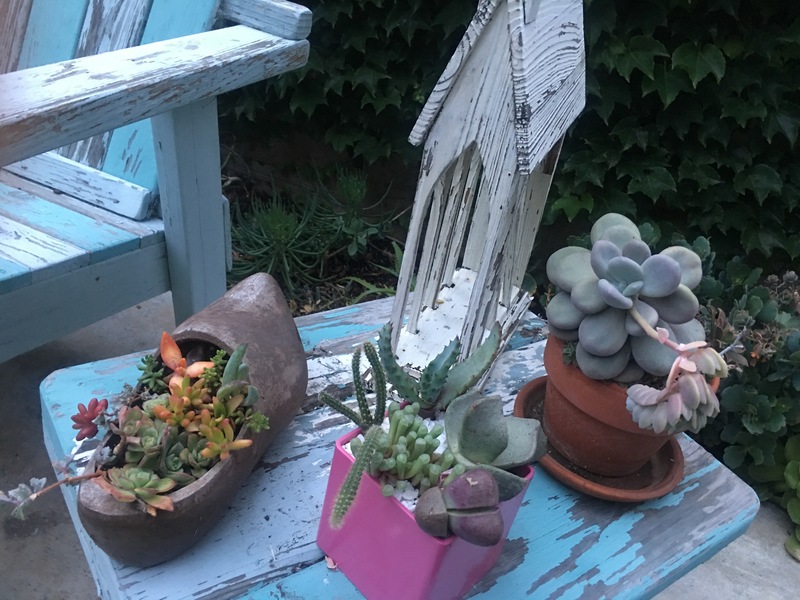 This family has experienced a loss first hand and is now healing through planting succulents and sharing the passion, making planters and holding classes on how to make awesome arrangements. I love their tag line –“Grow through what you go through”. Please visit their website https://www.beautifullytarnishedlife.com for more information! And to Austin and family – all the best and many blessings to your family! 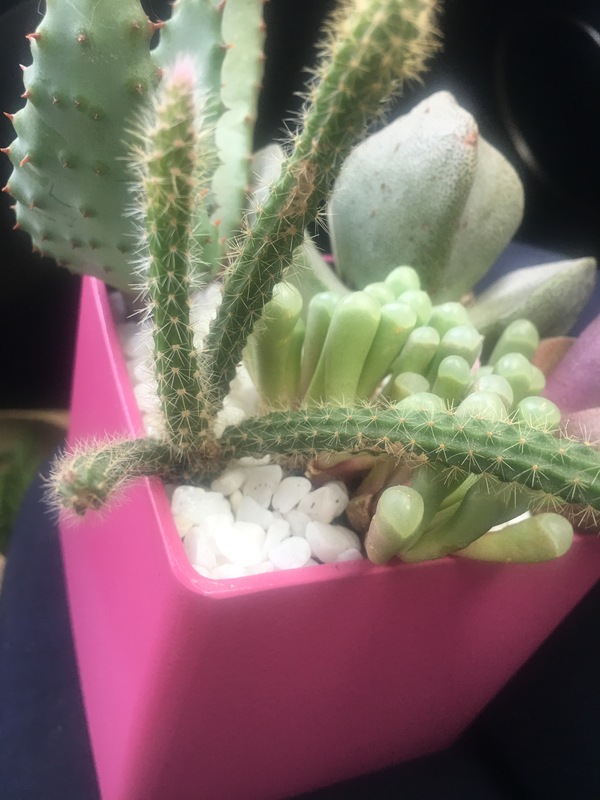 We started prepping for my daughter’s wedding six months ahead of time by planting succulent cuttings. Here’s some photos of the reception tables, including something special we did called a “Heritage Table” featuring photos of the many generations of marriages in our families. Enjoy! Maid of honor and bridesmaids with succulent bouquets. Wow, we just married off our youngest daughter and the wedding was amazing! Lots of wonderful little personal touches that made it intimate and reflective of their tastes and message. 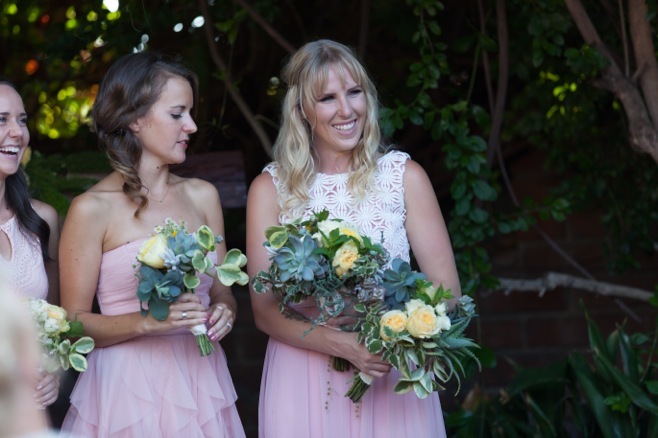 We worked in conjunction with her florist, Collected with Love in San Clemente, to grow most of the succulents that would be the base for the bouquets, boutonnieres, and center pieces. 20 bags of potting soil, 200+ plastic starter containers, 25 plastic trays later, we were ready. The yard was also used to trim, fill, and add to the array of plants. 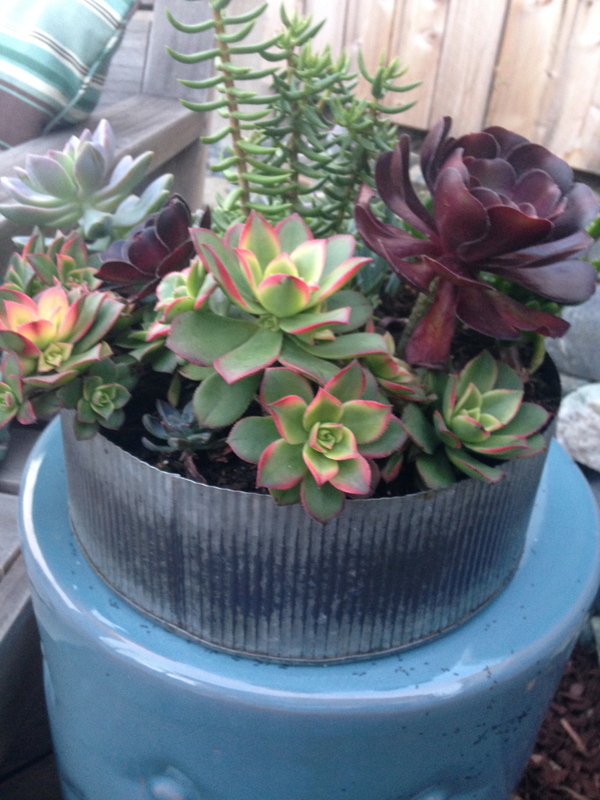 I can happily report that two months later, it is back to full glory – although it was very well sliced back to the point in which I wondered why I had offered 🙂 Honestly, trimming things in the summer does do wonders for the fall blooms of succulents. Here’s a few photos of the wedding prep and in the next post, I’ll show you the wedding photos with all the succulent amazement. I just got back from a wonderful two-day fall event at Waterwise Botanicals in Escondido, CA. If you are a succulent lover, visit them and you will feel like you died and went to heaven. There are acres and acres of colorful and amazing varieties of succulents and roses, lining the fields and hillsides and staging areas of design. It was also fun to be with 200+ others who are intrigued and obsessed by these plants – some even more than me! One of the events I participated in was hosted by Laura Eubanks of Serenity Gardens. With her excellent direction, we created a gorgeous Succulent Topped Pumpkin centerpiece, which will last well through the holidays. Three years ago, this creative Master Gardener was looking for something unusual to accent her holiday decorations, and after a little experimenting, she came up with the succulent pumpkin! Her creations are available for sale at a variety of locations including Roger’s Gardens and through her website. You can also request a custom gift, centerpiece or landscape arrangement and have it shipped to any location. Watch this instructional 4-minute video with Laura and photojournalist/author Debra Lee Baldwin for complete directions on creating your own masterpiece. Have fun! Send pictures! 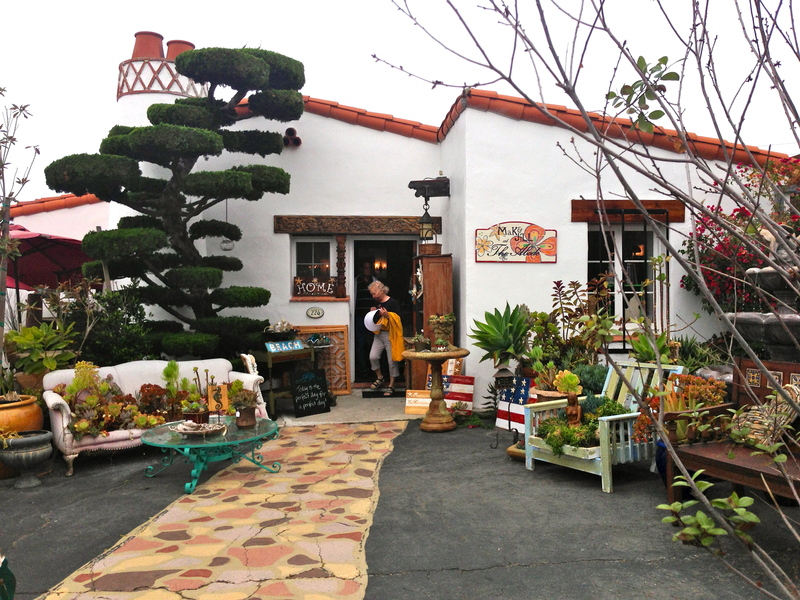 Succulent lovers, here’s an amazing place to stop on your way to San Diego – Succulent Cafe in Oceanside, CA. Have a cup of delicious locally roasted coffee, nosh a fresh baked pastry, cozy up in a chair and soak in the expanse of colorful varieties of succulents, art, and creative arrangements. The owner, Peter Loyola, has created a virtual secret garden right in the middle of town – vertical arrangements accented by drift wood, unique beds of Aoenium and blue fingers in repurposed rain gutters, and local artwork line the private, serene courtyard. Peter said his goal was stimulate all the senses, and he has succeeded! On the weekends, the cafe features local music, including an occasional visit by harpist Geri Afshari. The private patio is also available to rent for private parties, the perfect atmosphere for a small reception. Like them on Facebook to get notifications of special events including art shows and musical events. Featured in the Best of San Diego in San Diego Magazine, this little gem is worth the trip. Stop in and tell them you saw them on Everything Succulent! Pallets! They really are are everywhere, just looking for a home! These nice pieces of wood usually end up in the trash, then on to landfills. But once you get looking for them, they are easy to find. My local appliance store usually has a heap of them near the trash every week. Make sure you check the markings to make sure they are safe to reuse. Also, you can look for freebies on Craigslist or Freecycle.org where you are sure to find them. I had several given to me and stashed on the side of the house, while contemplating how to make them into a succulent garden. One morning this summer, Tom disappeared for a couple hours, then proudly led me to HIS creation! (I’m thinking maybe he was tired of seeing me hunched over in my garden, hunched over planting pots, then hunched over the rest of the day.) He partially dismantled a couple of pallets to make a usable, wide and deep potting bench. We topped it with a piece of purchased plywood for a total cost of $18. Anyway, here’s a bit of inspiration to re-purposing the ever-available wood pallet! 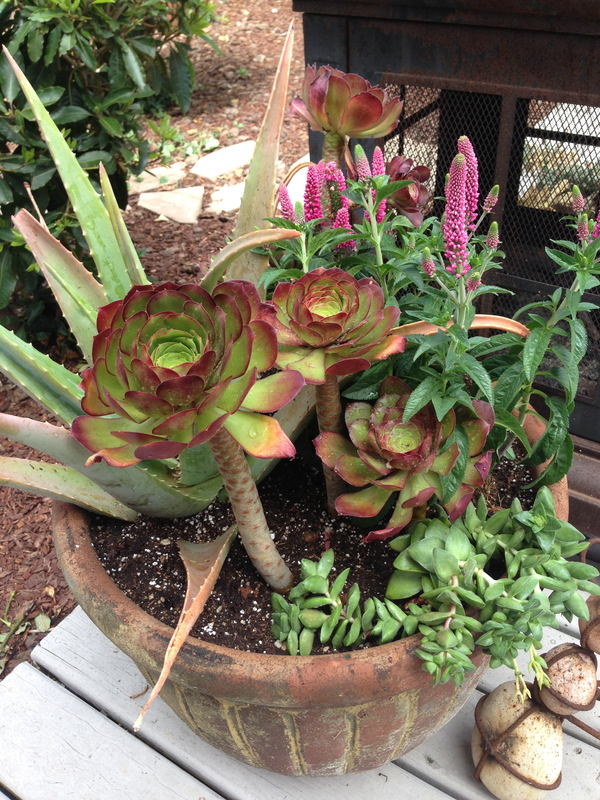 Time to give a refresh to potted succulents past their prime. With the exception of the pink Speedwell ‘First Love’ perennials, all the other plants are cuttings or replants from other areas of the yard. The two-colored aeoium or Saucer Plant is an especially easy to grow succulent from cuttings – old plants make new plants. Cut and dip in rooting hormone (I use Miracle-Gro Fast Root) but don’t often wait for the stem to callus over. Also seen here, an aloe which had outgrown it’s pot. Adding some summer interest like flowers can be a little tricky, as they might require more water than the succulents. Have fun planting! Send us your weekend re-pot. 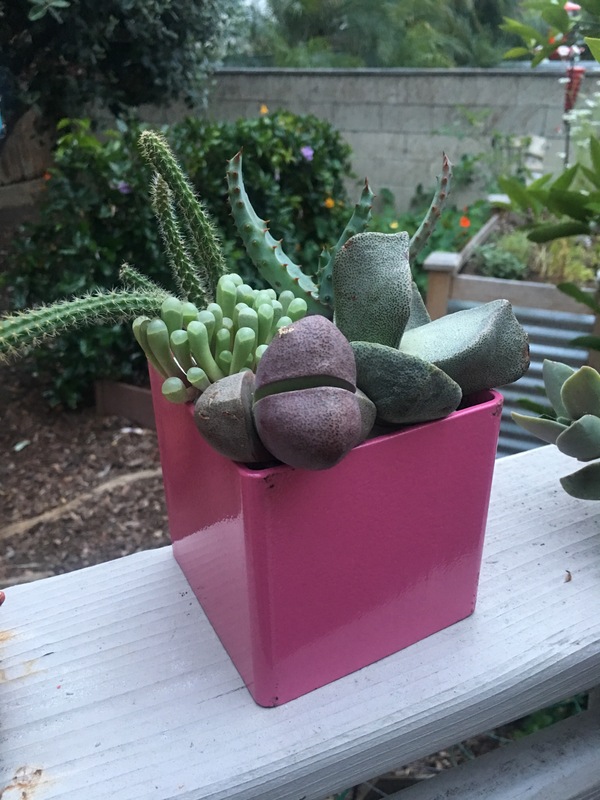 One of my favorite succulents is called Stacked Crassula. My sister-in-law, Ruth, gave me a one a few weeks ago, and I just repotted it. Stacked Crassula are very hardy and require very little care, and make a great companion to other potted succulents because of their pyramid like appearance. I like how some stand straight and others meander over the side of the pot. Here they are combined with Flapjack or Kalanchoe luciae and blue senechio in an old fashion tin french flower pot. This cost me NOTHING! The gift combined with other slips from the yard – done!